Iași ([jaʃʲ]; also referred to as Jassy or Iassy) is the largest city in eastern Romania and the seat of Iași County. Located in the historical region of Moldavia, Iași has traditionally been one of the leading centres of Romanian social, cultural, academic and artistic life. The city was the capital of the Principality of Moldavia from 1564 to 1859, then of the United Principalities from 1859 to 1862, and the capital of Romania from 1916 to 1918. Known as The Cultural Capital of Romania, Iași is a symbol in Romanian history. The historian Nicolae Iorga said "There should be no Romanian who does not know of it". Still referred to as The Moldavian Capital, Iași is the main economic and business centre of the Moldavian region of Romania. At the 2011 census, the city proper had a population of 290,422, making it the fourth most populous in Romania. With 465,477 residents (as of 2014), the Iași urban area is the second most populous in Romania (after Bucharest), whereas more than 500,000 people live within its peri-urban area. Home to the oldest Romanian university and to the first engineering school, Iași is one of the most important education and research centres of the country, and accommodates over 60,000 students in 5 public universities. The social and cultural life revolves around the Vasile Alecsandri National Theater (the oldest in Romania), the Moldova State Philharmonic, the Opera House, the Iași Athenaeum, a famous Botanical Garden (the oldest and largest in Romania), the Central University Library (the oldest in Romania), the high quality cultural centres and festivals, an array of museums, memorial houses, religious and historical monuments. Scholars have different theories on the origin of the name "Iași". Some argue that the name originates with the Sarmatian tribe Iazyges (of Iranian origin), one mentioned by Ovid as Latin: "Ipse vides onerata ferox ut ducata Iasyx/ Per media Histri plaustra bubulcus aquas" and "Iazyges et Colchi Metereaque turba Getaque/ Danubii mediis vix prohibentur aquis". Another historian wrote that the Iasians lived among the Cumans and that they left the Caucasus after the first Mongolian campaign in the West, settling temporarily near the Prut. He asserts that the ethnic name of Jasz which is given to Iasians by Hungarians has been erroneously identified with Jazyges; also he shows that the word jasz is a Slavic loan word. The Hungarian name of the city (Jászvásár) literally means "Jassic Market"; the antiquated Romanian name, Târgul Ieșilor (and the once-favoured Iașii), and the German Jassenmarkt, may indicate the same meaning. Archaeological investigations attest to the presence of human communities on the present territory of the city and around it as far back as the prehistoric age. Later settlements included those of the Cucuteni-Trypillian culture, a late Neolithic archaeological culture. There is archaeological evidence of human settlements in the area of Iași dating from the 6th to 7th centuries (Curtea Domnească) and 7th to 10th centuries; these settlements contained rectangular houses with semicircular ovens. Also a lot of vessels (9th-11th centuries) found in Iaşi had a cross, showing that inhabitants were Christians. The name of the city is first found in a document from 1408. This is a grant of certain commercial privileges by the Moldavian Prince Alexander to the Polish merchants of Lvov. However, as buildings older than 1408 still exist, e.g. the Armenian Church believed to be originally built in 1395, it is certain that the city existed before its first mentioning. In 1640, Vasile Lupu established the first school in which the mother-tongue replaced Greek, and set up a printing press in the Byzantine Trei Ierarhi Monastery (Monastery of the Three Hierarchs; built 1635–39). In 1643, the first volume ever printed in Moldavia was issued in Iași. According to the 1930 census, with a population of 34,662 (some 34% of the city's population), Jews were the second largest ethnic group in Iași. There were over 127 synagogues. After World War II, in 1947, there were about 38,000 Jews living in Iași. Because of massive emigration to Israel, in 1975 there were about 3,000 Jews living in Iași and four synagogues were active. Currently, Iași has a dwindling Jewish population of ca. 300 to 600 members and two working synagogues, one of which, the 1671 Great Synagogue, is the oldest surviving synagogue in Romania. The pogrom lasted from 29 June to 6 July 1941, and over 13,266 people, or one third of the Jewish population, were massacred in the pogrom itself or in its aftermath, and many were deported. In May 1944, the Iași area became the scene of ferocious fighting between Romanian-German forces and the advancing Soviet Red Army and the city was partially destroyed. The German Panzergrenadier Division Großdeutschland won a defensive victory at the Battle of Târgu Frumos, near Iași, which was the object of several NATO studies during the Cold War. By 20 August, Iași had been taken by Soviet forces. Iași experienced a major wave of industrialization, in 1955-1975. During this period of time, it received numerous migrants from rural regions, and the urban area expanded. The socialist period saw a growth of 235% in population and 69% in area in Iași; however, the urban planning was sometimes arbitrary and followed by dysfunctions. By 1989, Iași had become highly industrialized, with 108,000 employees (representing 47% of the total workforce) active in 46 large state-owned enterprises, in various industries: chemical, pharmaceutical, metallurgical, heavy equipment, electronics, textile, food, energy, building materials, furniture. Iași has a humid, continental-type climate (Köppen climate classification "Dfb" — summer wetter than winter, European subtype) with four distinct seasons. Summers are warm with temperatures sometimes exceeding 35 °C (95 °F) while winters are cold and windy with moderate snowfall and temperatures at night sometimes dropping below −15 °C (5 °F). Average monthly precipitation ranges from about 25 mm (1.0 in) in October to 100 mm (3.9 in)in June. Iaşi features historical monuments, 500-year-old churches and monasteries, contemporary architecture, many of them listed on the National Register of Historic Monuments. Notable architecture includes the Trei Ierarhi Monastery, part of the tentative list of UNESCO World Heritage Site, or the neo-Gothic Palace of Culture, built on the old ruins of the mediaeval Princely Court of Moldavia. During World War II and the Communist era many historical buildings in the old city centre (around Union Square area) were destroyed or demolished, and replaced by International style buildings and also a new mainly Mid-Century modern style Civic Centre was built around the Old Market Square (The Central Hall). The mid-1990s to early-2000s brought the first non-industrial glass curtain walled buildings (Romtelecom, Hotel Europa), while in 2012, in close proximity to the Palace of Culture, the Palas shopping mall and office complex was inaugurated. Iași is the seat of the Romanian Orthodox Metropolitan of Moldavia and Bukovina, and of the Roman Catholic Bishop of Iași. The city and the surrounding area house more than 10 monasteries and 100 historical churches. Among the oldest is Princely Saint Nicholas (1491), dating from the reign of Stephen the Great, and the Metropolitan Cathedral is the largest of its kind in Romania. The Trei Ierarhi Monastery, a unique monument, considered to be an architectural masterpiece, was erected in 1635–1639 by Vasile Lupu, and adorned with gilded carvings on its outer walls and twin towers. Great Synagogue, in late Baroque style, built in 1657–1671, is the oldest surviving synagogue in Romania and one of the oldest in Europe. Other examples of historic churches and monasteries (some of them surrounded by defense walls and towers) include: Socola (1562), Galata (1582), Saint Sava (1583), Hlincea (1587), Aroneanu (1594), Bârnova (1603), Barnovschi (1627), Golia (1650), Cetățuia (1668), Frumoasa (1726), Saint Spiridon (1747), Old Metropolitan Cathedral (1761), Bărboi (1843 with 18th-century bell tower), Bucium (1853). Eminescu's Linden Tree (Romanian: Teiul lui Eminescu) is a 500 year old silver lime (Tilia tomentosa Moench) situated in the Copou Public Garden. Mihai Eminescu reportedly wrote some of his best works underneath this lime, rendering the tree one of Romania's most important natural monuments and a notable Iași landmark. The Odd Poplers Alley, in Bucium neighborhood, is another spot where Mihai Eminescu sought inspiration (the poem "Down Where the Lonely Poplars Grow"). In 1973, the 15 white poplars still left (with the age ranges between 233 and 371 years) were declared natural monuments. Iași County has 387 centuries-old trees, of which 224 were declared monument trees and 160 got the Romanian Academy's approval and are proposed for such a classification. Most of them are oak or linden trees. The oldest tree in the county is the 675-year-old hybrid lime tree located in the courtyard of Bârnova Monastery, in the vicinity of Iași. When the lime was about 57 years old and had about 14 cm (5.5 in) in diameter, Iași was mentioned as an urban settlement, during the reign of Prince Alexander the Good (1408). As of 1 January 2016, Iași is the country's second most populous city after Bucharest with 362,142 residents registered within the city limits, and with a population of 465,477 residents, the Iași urban area is also the second largest in Romania. At the 2011 census, Iași was the fourth most populous Romanian city with a population of 290,422. The metropolitan area (which includes Iași and 13 other nearby communities) had a population of 382,484, while Iași County, with its 772,348 inhabitants, was the most populous county in Romania (after the Municipality of Bucharest). Additionally there were 60,000 more residents (mostly students) and thousands of daily commuters. According to the 2002 census, in Iași there were 109,357 housing units and 320,888 people living within the city proper. Of this population, 98.5% were ethnic Romanians, while 0.59% were ethnic Romani, 0.13% Jews, 0.13% Greeks, 0.13% Lipovans, 0.08% Hungarians, 0.05% Germans and 0.39% others. In terms of religion, 92.5% of the population were Christian Orthodox, 4.9% Roman Catholic, other religious groups 2.6%. There are currently almost 10,000 Roman Catholics living in Iași. There is a debate between historians as to whether the Catholics are originally of Romanian or Hungarian descent. The city is an important information technology sector centre, with the presence of several large multinational companies (Amazon, Oracle, Continental, Xerox, Accenture, Capgemini) and many other local and foreign companies such as Bentley Systems, Bitdefender, Comodo, Endava, Ness, Pentalog, SCC or TiVo (to name a few), as well as two universities which offer specific degree programs. Industry forecasts expect the Iași ITC workforce to grow from the current 12,000 (as of 2016) employees to more than 33,000, by 2030. 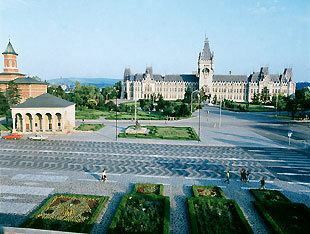 Four other museums are located in the Palace of Culture: with its roots dating back to 1860, the Iași Art Museum is the oldest of its kind in Romania, and, with more than 8,700 works (many of them belonging to the universal patrimony), has the largest art collection in the country; the Moldavia's History Museum, offers more than 48,000 objects from various fields, archaeology, numismatics, decorative art, ancient books, documents; the Ethnographic Museum of Moldavia owns more than 13,000 objects depicting the Romanian advance through the ages; the Science and Technology Museum's collection has more than 11,200 objects in five distinct sections and one memorial house. Iași hosts six cultural centres: French, German, British, Latin American & Caribbean, Hellenic, and Arab. Ion Ionescu de la Brad University of Agricultural Sciences and Veterinary Medicine - one of the oldest schools of its kind. Iași Science Festival is a week long festival organized every year in April (starting 2013) for high school and grade school students to get be able to observe and take part in scientific experiments and be given detailed tours of the scientific and technical universities and research labs in Iași. Over 200 experiments were performed and over 10,000 students took part in the 2014 edition, from throughout the Moldavia region. In 2012, Iași was selected as one of the European Cities of Sport. FC Politehnica Iași of the Romanian Football League from 1945–2010. Iași's public transportation system is served by the RATP Iași which operates an extensive network using 150 trams (electric trams began operating in Iași in 1900) and 175 buses. In 2014, RATP carried 50,358,000 passengers, an average of 140,000 passengers per day. Iași is served by the Iași International Airport (IAS) located 8 km (5.0 mi) east of the city centre. The airport is the 4th busiest in Romania and offers direct domestic, European, and Middle Eastern scheduled or charter connections. After extensive modernization works, the number of connections and traffic volumes have seen a significant increase, in 2015. Iași is connected by European routes E583/E85 with Bucharest through a four lane road, by European route E58 with Central Europe and Chişinău in Moldova, and by DN National Roads with all major cities of Romania. A planned East–West freeway would connect the city to the A3 Transylvania Motorway. Iași is home to at least 15 hospitals, including the St. Spiridon Hospital, the second largest and one of the oldest in Romania (1755), St. Maria Clinic Children's Hospital, Institute of Cardiovascular Diseases, Regional Oncology Institute, and Socola Psychiatric Institute (1905 - first psychiatric hospital in Romania). Iași has the second-worse air quality in Romania, after Bucharest. In 2014, the European Commission started environmental law infringement procedures against Romania, citing Bucharest, Iași, and Brașov cases as examples. In 2015, atmospheric particulate matter has repeatedly reached and exceeded legal thresholds for PM10. Pollution from vehicular traffic, construction works, and a lack of green spaces (the city only has about 11 m2 (118 sq ft) of public green spaces per capita) make up some of the reasons behind these problems.